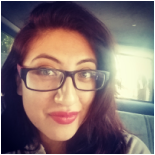 Patricia graduated in 2011 from Thomas Jefferson Senior High School and is currently attending CSU Northridge for her BA in Child & Adolescent Development and is minoring in Psychology. She has volunteered in educational programs such as LA’s Best and at child care centers. Patti began working with RISE UP as an interviewer in 2014. Nadia Barreda was born in Ambato, Ecuador and moved to Los Angeles when she was 7 years old. Nadia grew up in the San Fernando Valley and graduated from UCSB in 2011 with a major in Physical Anthropology. She began working at UCLA for the RISE UP study in March 2013 as a staff research associate. Nadia is also a Zumba instructor at UCLA and is currently studying to become a Substance Abuse addiction counselor.